Series AFR Air Filter Regulator provides clean air pressure to pneumatic controllers, valve positioners, air cylinders and other equipment. 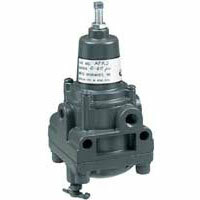 Self-relieving regulator is equipped with a 40 micron filter housed in a dripwell with gage port. Body: aluminum alloy, irridite, and baked epoxy finish; Filter: phenolic Impregnated cellulose; Diaphragm and Valve Seat Plug: nitrile elastomer. 0 to 160°F (-18 to 71°C). 1" (2.5 cm) of water. 20 SCFM (33 m³/hr) @ 100 psig (700 kPa) supply. 0.1 SCFM (0.17 m³/hr) with downstream pressure 5 psig (35 kPa) above set point.